The people who used to live behind us (where we lived before moving here) got a beautiful tiny white fuzz-ball of a kitten one year; born of a farm cat from somewhere in western NC. Their daughter, who was in elementary school at the time, was the primary caretaker of this kitten. He was of Persian descent, and because he shed a lot of long white hair and scratched their drapes, they never let him in the house. He lived in their motor boat, on the carport. Everyday when the daughter got home from school, she would feed and play with the kitten, whom she named Snowball***. A year later, when the daughter got into middle school, she was busy with classes and friends and so she had little time for her cat. He began to venture out of their yard and into ours on a daily basis. We had a cat at the time, named Ping, and Snowball was very interested in the location of Ping's food bowl. My children used to leave and enter the house through the garage all the time, and Snowball soon learned that if he timed it just right, he could make a beeline for our kitchen and Ping's food bowl, before the storm door closed on his tail. It got to be quite a chore to haul him out of the house, because every single time one of my kids would open the door - Snowball would shoot in like a bat out of hell, run straight to the kitchen and chow down as much as he could before I scooped him up and put him back in the yard. After several weeks of this, I tired of the game and let Snowball stay in the house as much as he wanted. He luxuriated on our beds and couches, he sprawled on the carpet wherever there was a patch of sunlight, he helped himself to food and water - and even Ping got used to him being there - though he was never happy about it. Every night I would put Snowball back outside so he could go home and sleep in the boat and every morning he was right back on our doorstep. I realized that this cat was not happy at his old home and was choosing to live with us. It was so hard for me to understand why his owners didn't take better care of him; he was the most beautiful white Persian I had ever seen - except he had a few bad habits. He seldom groomed or bathed and so he was covered in North Carolina's ubiquitous red clay most of the time. He had tangles and burrs in his fur too. So one day I spotted him laying on our picnic table, and I decided to have a talk with him. I sat down on the bench, eye to eye with Snowball, and told him that he was too beautiful to be so slovenly, that if he wanted to live with us full time, he had to shape up and start cleaning himself every day; that no one would think he was loved if this was the way he presented himself to the world. You will most likely not believe what happened, but I swear it is true. A short while later, he bathed and cleaned himself, and from that day forward he was very good about staying as clean as possible. I told his owners about our little talk and they laughed about it, but seemed uneasy at the time. 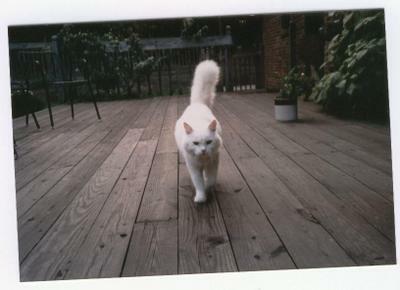 About a month later, they called me to the fence between our yards, and very ceremoniously they handed Snowball over the fence to me and said that from that time on, he was my cat. My first thought was "It's about time!". He was with us altogether for about 9 years, and while I have had cats for longer periods than that, none was ever loved more than Snowball; perhaps that was because he adopted me. ***Note: had I been naming this cat in the beginning, I would not have chosen "Snowball". With my perversity, I would have probably named him Pepper! He is beautiful. I'm sure you made his years very happy. Can we expect this story shared at Friday's Ark? I just love this story. Snowball knew where the love was! Of course, Snowball is a name a little girl would choose for her kitty. My son always named his pets whatever color they were with an "ie" on the end: Blackie, Goldie, Whitie, Grayie, etc... You get the point. I'm glad that the owners were smart enough to realise what was best for Snowball. That pic of him is great. What a lucky cat..and a lucky owner.. He's beautiful! How lucky to have been chosen by him! Judy, you know I'm such a sucker for kittie stories. This one is such a pretty kittie, too. I had a "chat" with a puppy once when I was a kid - about pooping in the back yard. After that he would make the trip to the woods. I do believe in this sort of thing. Beautiful picture, Judy. what a pretty cat! Wow! I can't believe that happened. Not sure if I could have given my cat to a neighbor, but if I were you, I'd have taken him too. I think it's a wonderful thing when an animal chooses a family that better suits him, and actually wants him. I have a strong belief that if pets aren't going to be a real part of your family and live in your home with you, then you shouldn't have pets. What a lovely story! Cats are fickle creatures and I am much more of a dog person, but Snowball is undeniably a very handsome and clever cat. That is a nice story. I don't really like cats, but that one sounds nice. I would have named him Midnight! Seriously, I do believe in talking to pets as if they too speak and understand English. On some level they do understand. Cats rule! I have seven of them. Just lost #8 two weeks ago; she was 18 years old. Snowball was a beautiful cat! I like the grooming talk - LOL! What a cute story Judy! We named him Otis and he was a dead ringer for a younger version of my Jazzy. I miss the little bugger. What a sweet story!!! Snowball's a lucky cat! Michelle sent me! Cat's are cute. They have to be. Otherwise no one would put up with them. My parents are suckers for orphan cats. Great story! All the animals I have ever had either adopted me or I went and adopted them. There is just something special about that bond. This is such a great story (and I am not even a cat lover). I'm glad that cat wound up with the right home for him, though. I'm visiting from Michele's today. Not a great cat person me...quite the opposite. Buta nice Story all the same. Animals have an instinct...they follow good people. What a wonderful story Judy..I believe in talking to animals, too...I jnow Sweetie understands everhing I say to him..He is a VERY smart animal, as I think most cats are....How wonderful that you had him for 9 years...He sure was a pretty pretty kitty, too! Cute cat! Good story, too! he's beautiful. i have had several pets adopt me. even had a dog that adopted a cat once. I already commented on the bird post, so I went to this one. I liked it a LOT better. What a gorgeous cat, and how lucky he was to find such a great family to adopt him. This is a lovely story. Michele erroneously sent me, but I'm glad I saw this post! What a sweet story. It is a pretty-looking cat. Love the bolting in like a bat out of hell. lol. I can completely picture it. I swear cats do understand more than we give them credit for. What a great story! I do believe you spoke to him and he knew what you were saying. I have always been an animal lover and believe they communicate with us. I'm glad Snowball got to finally be with the family he was meant to be with! What a wonderful story, J. I needed this, particularly today; it was very uplifting. Thanks for sharing. Thanks for visiting my photoblog and leaving the link to Snowball's story there. I loved the story and quite believe that you talked him into grooming himself better. I found the cutest photo on your site. I loved this post. I'm going to be adding your blog to my list of favorite reads on my sidebar on Suburban Island so it is easy for me to come visit again! I bounced here from Loren's blog. I wasn't prepared for the ending of your story: all along I was reading it as if Snowball was still alive. Really felt desolate when I found out he wasn't. Beautiful cat. What a tail! I know what you mean about Persian cats in NC. I had one when I was little. The heat and burrs really took a toll on her fur. I have a problem that I am not sure what to do about, well for me its not a problem but i suspect it is for my next door neighbour. My Neighbours had 2 cats from our local protection league 7 months ago. I dont have any pets myself although i do adore all animals. So now both my neighbours have 2 cats each and i have always made a fuss of all of them as and when they venture into my garden or sometimes my home, the problem being that one in particular, she's an adorable cat and so fussy and always meows at me all time, if i am in the garden she follows me everywhere i go and then wants to come inside when i go in, she is so calm, loyal and peaceful and just adores her cuddles. The trouble is she is constantly sitting outside my house in my garden looking in at me through the big french doors and looking sad as if to ay "please let me in"....i cant stand to she her outside, especially at night in the early hours when i can hear her crying by my door frommy window so i let her in and she comes straight upto bed with me and at times even slips under the duvet next to me for her little cuddle for 10 or so minutes before sleeping at the foot of my bed. if i dont let her in she goes to the front of my house and stands on my window frame walking along it to get my attention so i will let her in. She is now at my house more and more and sleeps her alot of the time and seems to want to stay curled up or sitting next to me watching me at work in my office here at home, she is now really loved and comes and goes when she wants, but now on a number of occasions her owner whom i must add has 2 very boysterous boys and 1 older daughter, keeps knocking my door to ask if i have her and that i am not allowed to let her into my house and i should put her outside. I dont see that she loves the cat ( I wont name the cat as i dont want my neighbour to be offended that i am writing this) it feels more like she is making a statement that she is her cat and belongs to her and that she isnt mine. I never intended to take the cat away from her but i look at her beautiful soft eyes and her adorable face and my heart just melts away and i cant leave her outside crying...even worse when it is cold and raining....so much so that i worry about her now all the time and cant seem to sleep at night if i think that she may be outside all alone. I think my neighbour is now getting very angry and i do fear that its all about to come to a head and i will be left feeling rotten and missing my new little friend and her missing me as i wont be allowed to let her in or sleep over at night. can anyone tell me what i should do, should i stop letting her into my home? any advice is welcome. Thank you all. Anonymous, I do wish you had left a better way of answering this than here in my comments. If I were you, I would go to the neighbor and explain why you let their cat into your home (she begs, bad weather, etc.) and if she has a heart at all, she will understand. If she doesn't care what you say, then I see no good end to it. You may continue to let the cat into your home, but you run the risk of a bad situation with the neighbors, which can be terribly uncomfortable. I understand how you feel, as I cannot resist an animal either, particularly one that is neglected. I hope you come to some understanding with them - one that is in the best interest of the cat.